We also provide many different options for those people who are looking to get involved in Racehorse ownership. Buisness and corporate syndicates. Use your racehorse as a running advert! We can help advise you and organise purchases of horses you would like sole ownership in. We are active at all Bloodstock sales and can also offer advice on private sales. We can organise to source horses for lease from studs so you can race without outlaying a large sum for purchase. 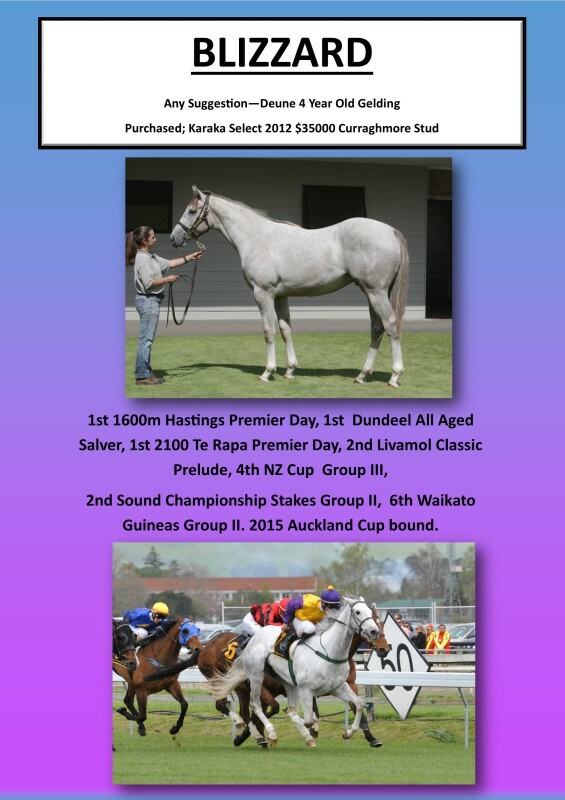 Blizzard; Purchased at the 2012 Karaka Select sale for $35000. He has since go on to run in some of New Zealands biggest racing contests including the NZ Derby, Auckland and NZ Cups. He has won over $120,000 in just 19 starts and is being aimed towards an Australian Campaign this Spring. Stratocaster; One of our very impressive up and comers and really looks a Group One racehorse in the making. Purchased at Karaka Premier in 2013, He won the Hawkes Bay Guineas Prelude at just his second start and was 5th in Group One 2000 Guineas. He sustained a minor injury during his derby campaign but is such an exciting prospect for next season. Gotham; Puchased at the 2014 Karaka sales he was given a very light 2 year old preparation as he was bought with the intention of racing at three. He gave us all a big thrill though running a fantastic last to second at the Boxing day 2 year old race and gaining a spot in the Karaka Millions. From just four starts he has brought back over $35000 in stake money and we have so much more to look forward to with him.